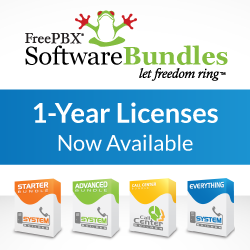 FreePBX was primarily designed to be a simple and easy to tool for programming asterisk dialplan and call flow. In the name of simplicity, however, it is sometimes necessary to sacrifice advanced features and overly complex ways of doing things. FreePBX takes a great middle ground in providing the best of both worlds: on one hand, an extremely powerful yet intuitive and simple GUI, and on the other hand a really neat way to seamlessly extend the gui into ‘raw’ dialplan. This is done using a combination of the Custom and Miscellaneous modules. followed by a dialplan reload (asterisk -rx "dialplan reload" or asterisk -rx "extensions reload" if your on asterisk 1.2). That’s all! Now pick up an extension and dial 66. You should hear the tt-monkeys file being played back. While this method is really simple, its got its drawbacks: If you were to include some code with, say, extension 66, and then you would set up a phone at extension 66 in FreePBX – what would happen when you dial 66? That’s right, asterisk would be kinda confused: it wouldn’t know which ’66’ to call (actually it would pick one of them – but which is another story). In order to prevent such a situation, FreePBX rigorously protects the dialplan from having a double entry. You can’t, ever, have two extension with the same extension number (try it!). You also can’t have other ‘destinations’ (which are also called extension in asterisk dialplan language) such as ring groups or queues with the same extension number as another extension.